There are excellent scenic trails in Bermuda for horseback riding. The trails lead through lush landscapes, villages, or along the old railway trail or even along the beaches. Some times they also cross the streets. The laws around horse riding in Bermuda is quite stringent. An experienced local supervisor must be accompanying you, particularly if you are riding close to a public place like a beach. The supervisor usually doubles up as a guide and explains a lot of flora & fauna as well as history of the island along the way. Generally you can not ride on a popular public beach. There are however beach side trails (along the south shore beaches) which can be used for horse riding. You can ride in Bermuda all through out the year. There are several riding centers or stables that offer horseback rides in Bermuda. Most of the riding centers require advance bookings. There are both group and private rides offered. Depending on your riding skills, they will select a horse. Usually for group rides and inexperienced riders, they select quiet horses and do not encourage trot or canter. 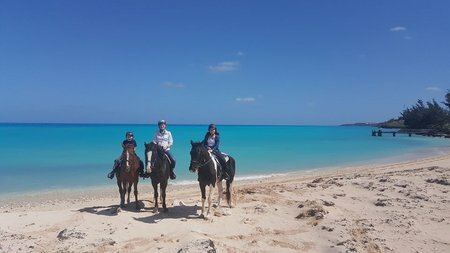 Located in Warwick Bermuda, Spicelands Riding Center offers trail riding, full service boarding facilities, and riding lessons at all levels. The facility is setup in a rural settings and has an easy access to the Railway Trails that provide scenic trail to the Warwick Long Bay beach. And then it further leads to the south shore beach trail passing through some of the top beaches. For the trail rides, the riders should be 13 years or above. Also the horses can carry persons weighing up to 225 lbs. The Private Ride is limited to a private group, this ride is an hour and a half long. It's designed for experienced riders or those wanting a private experience. The Group Ride is for an hour. It's a walk paced ride along the trail. Pony Rides are offered for kids under 6 years. Protective headgear is provided; hard-soled shoes or sneakers are recommended. Spicelands also offers Riding Lessons Program which runs from 7.30am to 6.30pm, six days a week. The program comprises of stable management & riding. You can learn a lot about the horses, its care, health, nutrition and movement. This knowledge helps the rider in understanding how to ride & become a better rider. Ride Times: 9am, 9:30am, 11am, 2pm and 4pm. Spicelands is located on Middle Road, Warwick. Bus Route # 8, takes about 30 minutes from the dockyard (Kings Wharf). Early rides will require a taxi as the bus will not reach on time. They have been operating the stable for over 20 years offering trail rides as well as riding lessons in small groups. They are located in Warwick parish. The trail rides at this stable allows you to walk, jog/trot, and canter if you are experienced or walk/jog for beginners. Because it is only one morning and afternoon ride per day this ride is twice the distance of any local stables ride but for a similar price. Of course private rides will cost you more. The trail guide offers a personalized service and is one of Bermuda's premiere horseman and takes you on a ride throughout Warwick Parish on the back roads, old railway trail, tribe road trails, beach trails, and in some of the most scenic parts of Bermuda. Natalie & Mark Moran tailor the rides as per your choice and time. The rides usually include wonderful trails along the north eastern coastline in St George. Some of the common places visited during the rides are St Catherine beach (next to St Catherine fort), lush grounds from where you get lovely views of Coot's Cove, the upper-land area of Tobacco bay beach and many others. Some of the popular rides includes 'Scenic Coast Ride' for up to 1.5 hours, 'Sunrise Beach Ride' (at 7:15am between May - October, up to 1.5 hours), 'Tour the Olde Towne of St. Georges & Surrounding Parish' for 2 hours, etc. They are open Monday through Saturday, and on some holidays. Located in Devonshire Parish, this center caters to juniors up to the age of 18. They offer riding instructions by qualified instructors throughout the day. The center has an outdoor arena. Riding lessons are available by reservation and there are hourly rates. Tribe Road #1, Devonshire, Bermuda. Phone: 441-236-4181. It's located in Devonshire parish. There are many equestrian events that are held in this center. Check out National Equestrian Center to know all about it. There are stringent regulations imposed by Bermuda Department of Parks for accessing various public areas by horses. During the summertime when it's the high tourist season, these regulations are usually more strictly followed. Check out Beach Regulations for Horses to know about the current restrictions. Horseback riding has always been something I love to do, however my husband prefers not to. However, he reluctantly agreed to go on a ride in Bermuda. A taxi driver set us up with Mike's Unique Horse Services and the driver advised this would be a different and fun experience. Well, he was right! From the minute we first meet Mike, he was fabulous! He was eager to share his knowledge and experience of horseback riding with us, he taught us valuable tips on handling the horse which we both enjoyed. We had a fantastic ride through the streets of Bermuda, through nature trails and the beach views were awesome as well. We experienced a true horse back ride, where we directed the horse using the tips Mike taught us. This is not a nose to tail trail ride in any aspect, which is why it was such a special time. Both my husband and I agreed this was the highlight of our time on Bermuda.